COME on girls, the old Beach Cricket Club really, really needs you! We are still putting out a call for girls wanting to have healthy outdoor fun while playing cricket in the Old Beach area. We are seeking to give girls between the ages of 10-13-years-old an opportunity to play cricket in the Hurricanes Under-14 girls league but time is running out! Response to our call has been very slow and while we are disappointed with the take up, we are definitely not going to give up. As soon as we get a few girls interested we will be able to have a hit and a throw at a time that suits most local girls and their parents. As I said last month, I would have loved my daughter to have had the opportunity to play cricket 20 years ago when she was going to Brighton Primary and I am really hoping my granddaughter will get the opportunity in 10 years from now. So, this is your opportunity to step up, play the game and enjoy but we need your participation. We are planning to play at Cloak Oval in Jetty Road Old Beach. There will be no charge and games will be played Tuesday nights starting November 7 from 5pm. At a recent meeting with Mia Blignaught and Paul Collins from Cricket Tasmania it was clear girl’s cricket will be the next big opportunity for sporting-minded young women to join the pathway in a sport that could see them playing representative professional cricket and not having to leave the State. An Old Beach Cricket Club girls’ team will have access to some of cricket’s top coaches and resources – an opportunity that would be a terrible shame to miss out on. 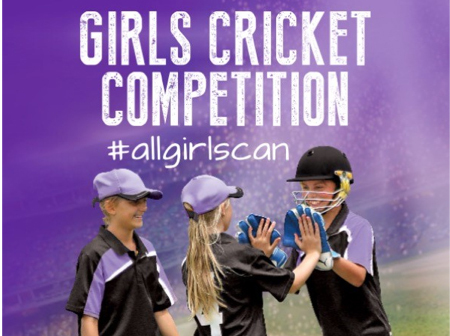 Cricket Tasmania has already begun promotional activities in the local schools so we are hoping this will really encourage girls in our area to give it a go. Old Beach Cricket Club is keen to get the ball rolling and really would like to hear from any parent on behalf of their daughters that might just like to play or even attend a come and try session at the club. A grant applied for by the Club from the Commonwealth Bank through Cricket Australia was successful and will be used to help us in getting the team together so there is no charge to you as a parent. In the first years of playing the focus will be on just having fun and improving your skills at the individuals own pace. Naturally, the success of the club’s efforts in getting girls onto the pathway to cricket sporting excellence will be the level of interest indicated by girls and commitment from their parents. I really urge parents to encourage their girls to give it a go. Don’t forget, All Girls Can and this is your time to come and enjoy a great team game. Please contact me as soon as possible at phil.owen@brighton.tas.gov.au or message 0419 333 252.